This is the story of Chika Honda. CHIKA begins with Chika's release from a Melbourne prison. She is met by Mayu, a documenter who helped her tell her story. The story then goes back in time to when Chika first met Mayu, and unfolds with Mayu's narration along with the voices of Chika and others who know Chika's story. In 1992, Chika Honda was a 36-year-old Japanese woman working at nights in a pub in a satellite town north of Tokyo. One night, Mitsuo, a regular customer at the pub, asked her to join him and his brothers in a tour group holiday to Australia. Chika accepted, looking forward to her first overseas trip. She had heard of koalas and kangaroos. On the way to Melbourne, the group stopped over in Kuala Lumpur. A local tour guide, Charlie, a business associate of Mitsuo's brother, picked them up at the airport and took them to a restaurant before checking into a hotel. While they were having their meal, their van and their suitcases inside it were stolen. Charlie told the group to check into the hotel and wait until he sorted things out. The next morning, he returned with their belongings and a new set of suitcases, explaining that their luggage had been slashed with a knife. Most of the contents had been left intact, so the new suitcases were packed. When the group arrived in Melbourne, customs found 13kg of heroin in the lining of their suitcases. Chika and the others were arrested, investigated, charged and later tried and sentenced. 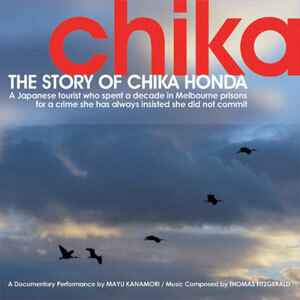 Many events resulted in Chika's plea of innocence not being heard: inadequate interpreters during the investigation and trial, unknown to investigators; a jury and the judge who did not understand Japanese; inaccurate Melbourne media reports about "a Japanese mafia syndicate"; the trial of all five in the tour group at once due to cost cutting measures; and legal aid lawyers advising the accused not to take an individual stand during the court case in case it disadvantaged the others. Chika's life in prison began without any English. She became depressed and suffered panic attacks. When her application to the Supreme Court failed and all other legal avenues to prove her innocence failed, she tried to kill herself by slashing her wrist in the middle of the night. Her survival awakened her to a realisation that God had given her longer to live and have more lessons in life to learn. Chika learned English, became accustomed to Australian ways and made friends in prison. One day a prison officer gave her a kitten Chika named Ai - her mother's name, which means "love" in Japanese. After serving her full sentence, Chika was released from prison in 2002 and immediately deported. Ten and a half years in jail left Chika afraid to return home to face a new life. During the eight months Mayu visited Chika in prison and researched her story, she crossed the line from documentary-maker to friend, and she helped Chika take her cat Ai back to Japan. In return, Chika agreed to be photographed, and Mayu documented Chika's journey back home. Chika's Japanese lawyers had organised a press conference on her return. She found herself at odds with her mother, who had been lying to the rest of their family about her plight and who preferred she forget about what had happened. She didn't want Chika to tell anyone about her experiences in Australia because of the shame it would bring to the family. However, Chika decided to come out, speak out about her innocence and show her face in front of the cameras.